A cross bore is defined as the intersection of underground utilities. Technically, a cross-bore can occur between any underground utilities, including (but not limited to): electric, communication, sewer or gas—however, it is most dangerous when a gas line intersects a sewer. Results of many cross-bore inspection projects show that in high-risk areas there are an average of two to three cross-bores per mile of sewer line. Large communities can have anywhere from 1000 to 6000 miles of sewer lines. As the reliance on trenchless technology installation methods continues to grow, the demand for services to help mitigate cross-bore risk will grow with it. The stakes are too high to let cross-bores go undetected! Tele-Vac prides itself as a pioneer in the cross-bore inspection industry and understands the need for identifying cross-bores. Tele-Vac is heavily involved in several cross-bore focus groups, and has worked on several legacy pre-and-post-construction projects all over the USA! Our team consists of the most experienced management and technicians working in the cross-bore industry today! Tele-Vac has the ability to complete large projects of thousands of laterals as the industry tries to mitigate legacy cross-bore risk. Tele-Vac’s CCTV fleet contains the latest technology from IBAK, Rausch and RSTechnical camera systems, and provides the means to verify that gas and other utilities’ lines have not penetrated sewer laterals. These cross-bore inspections ensure the safety of the public, prevent service interruptions and potentially catastrophic explosions. 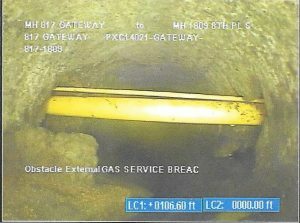 All sewer inspections are documented with written reports, GPS locating information, photographs and digital video recordings.